As a teacher, your day depends on your lesson plans. They are what keep you organized, on track, and prepared to teach each subject. They also help you reach milestones and achieve academic goals. Lesson plans help you stay on top of copies that need to be made, keep pace with testing schedules, and stay prepared for last minute substitute teachers. After logging in to your Gynzy account, begin to create a lesson plan by selecting activities from the Tools tab and opening them on your board. Save the activities and tools you wish to use in your My Lessons tab. By creating a new folder for each subject, you can build lesson plans for math, language, arts, science, social studies, and more. You can also use the editing tools on the Board tab to insert text, pictures, or other objects such as timers, stoplights, and sticky notes into your plans. Using Gynzy to create and save your plans provides you with easy access every time you set up your interactive whiteboard. Since these tools are specially designed and teacher tested for your interactive whiteboard, you can be sure the applications will run smoothly and display clearly as you open each saved tool. Since Gynzy also allows you to upload PDFs to your lesson plans, you can incorporate files from other applications on your computer. On the Board tab, select the large plus sign at the bottom and choose the ‘open PDF’ option. You can also add videos, music, and medial files using this same process. 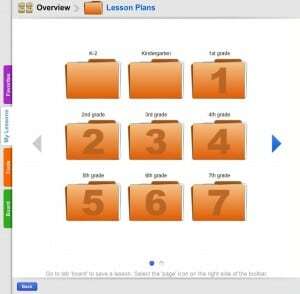 Using Gynzy to set up and store your lesson plans also makes bringing in a substitute teacher simple. Rather than searching through your desk and cabinets for the required supplies and teaching aids, they will have everything they need for each lesson of the day waiting for them on your interactive whiteboard and Gynzy. Since lessons can be changed or modified as needed, it also makes adding or deleting tools from your plans easy. It can be easy to become overwhelmed during the lesson planning process. With so many important concepts that need to be covered, trying to figure out where to fit each one in can be difficult. Eliminate this concern by following the steps below as you create your plans. For this example, we will create a sample plan for a language arts lesson. a) Introduction: Tell your class about the new topic you will be studying and introduce them to a few basic related principles. For example, if you are preparing a language arts lesson on synonyms and antonyms, review the ideas of things that are alike and things that are opposites with your class. Continue teaching with examples by now displaying two different columns of words for your class using your interactive whiteboard and the Gynzy tool, Synonyms and Antonyms. Select either the ‘synonyms’ or ‘antonyms’ options on the tool then have your class match the two columns of words. You can do this either as a whole class activity or by splitting your class into teams or groups and allowing each to take a turn. c) Reinforce the concept through a game or activity-Now that you have introduced and discussed the new concept, play a game with your class in order to reinforce what you’ve taught. Use the Gynzy Hangman With Your Own Words tool and split your class into two groups. Have each group take a turn guessing letters until one group is able to guess the entire word. Points can be awarded if desired. Since this tool lets you create your own list of words to play with, choose words that will allow you to ask follow up questions regarding a synonym or antonym. For example, if you one of the words you use is ‘beautiful,’ ask the class for a synonym of this word once they’ve guessed it correctly. They can answer with words such as ‘pretty,’ ‘lovely,’ or ‘cute.’ In this manner, your class is both learning through application and also having fun. d) Provide another reinforcement activity with an in-class assignment- Once you have reviewed the concept with your class again through a game or activity, provide an in-class assignment that can be done independently or in pairs. Use the Gynzy tool Create Your Own Memory Game and have your students make their own synonym or antonym word list that will be used in a matching game. For example, if you are having your class work with antonyms, tell your students to make words that can be matched as opposites. Examples are ‘light’ and ‘dark,’ ‘day’ and ‘night,’ ‘hard’ and ‘soft,’ and so on. Once your class has completed their lists, have them play the game with their partner. If there is time left over, you can have them make another set of words this time using synonyms for matches. e) Provide a homework assignment- If desired, follow-up the new concept by handing out an assignment to be completed at home. This will allow you to see how well your class comprehends the principles. One of the great things about being a teacher is that you have access to dozens of other teachers who have taught the same concepts and have created their own lesson plans for them. Teachers are always looking for new and innovative ways to present concepts to their classes. By sharing which lesson plans have worked and which have failed in the past, teachers help each other with the planning process. Since you can open your Gynzy lesson plans from any whiteboard or computer anywhere, sharing with another teacher is easy. You can save your lessons to your computer or to a removable storage device then upload it to another computer later. You can also print your Gynzy lesson plans from your computer which means you can send activities home with students as homework or share them with another class. For days when you need a last minute lesson plan or are looking for some lesson plan inspiration, use one of the already assembled Gynzy plans. These can be found in the My Lessons tab in the Lesson Plans folder. These plans range from K-8th grade and include language arts, math, science, social studies, and theme plans. Just click on your grade level, then choose the subject for which you need a plan. Folders of ready-to-use plans will displayed from which you can choose. These plans also make a quick substitute teacher fallback for those days when you have to call in sick or are out for a last minute meeting. All the substitute will need to do is click on the preassembled plan and follow the slides. If you’re new to using Gynzy or to creating lesson plans, use these already completed plans as your template. Insert the tools, activities, games, media files, and PDF files that you desire as you move through the slides. This will help you stay organized and gain experience as you become accustomed with the process. Creating effective lesson plans is an essential part of every teacher’s job. Using the tools provided by Gynzy will allow you to build unique and interactive plans that will engage your students and help them retain the information you’ve taught. It will also help you stay focused as you work toward completing your educational goals. Since being a teacher also means lots of last minute assemblies, snow days, fire drills, and other interruptions, using the tools by Gynzy will also allow you to make modifications to your plans quickly and easily. This will ensure you stay flexible but on track. Regardless of which subject you’re teaching or which new concepts you’re building, Gynzy has the tools and guidance to help you create effective lessons that will benefit both you and your students.